All we know WhatsApp is widely used around the world. There are billion of users who are daily sending messages, audio, video, images to each other. Sometime, few person’s has been blocked your contact number on WhatsApp account. In that situation most of users try to unblock his number, but they are not getting the success. Don’t worry in this article we have to discuss how to unblock yourself from someone’s on WhatsApp. First you should know who is blocked you on WhatsApp account. There is an easy way to check if someone blocked your number on his WhatsApp account then you are not able to view his last seen status, not getting message delivery status, check profile picture etc. If you are not able to view these information from your WhatsApp account that means he has blocked you on WhatsApp. In our previous article we have already discuss top WhatsApp problems and solution. You can get help if you face any problem which is related with WhatsApp account. After checking which person blocked your number on WhatsApp, you have to take given few simple steps to easily and quickly unblock yourself from someone’s on WhatsApp. But during doing this process you have to understand that you are not able to take your WhatsApp backup. If you already has WhatsApp backup and try to restore your account then you are not able to unblock yourself from someone’s on WhatsApp. So, first you have to decided yourself are you comfortable or ready to start this process or not. Step 1: Open your WhatsApp account by tapping on the WhatsApp icon on your Smartphone or Android phone. Tap on the three dot vertical icon in WhatsApp window, which is placed on top right corner. Step 2: You will get different options now, tap on the “Settings” > tap on the “Account” option > finally tap on the “Delete my account” option. Enter you contact number in the box and tap on the “Delete my account” button. After sometime your WhatsApp account is deleted from your phone. Step 3: You have to properly uninstall WhatsApp from your phone. After that you have to restart your device or phone. Step 4: After restart your phone again download WhatsApp from Google Play Store and follow steps to install WhatsApp on your device or phone. You have to fill your Contact number, Country code, OTP during the installation process. After finish this installation process. You can able to easily send messages, images, audio or video to that person who is blocked your number on WhatsApp. 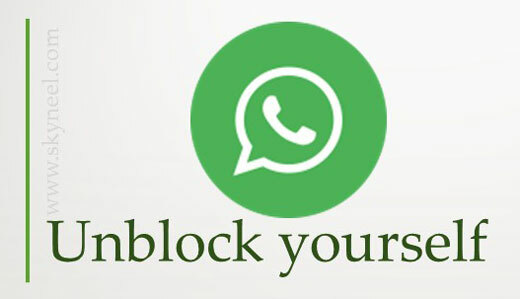 I hope after reading this guide you will be able to unblock yourself from someone’s on WhatsApp. But, if someone is not interested or blocked you again and again then there is no need to follow these steps. If you have any query regarding this guide then write us in the comment box. Thanks to all.